← New Chamilia for Spring – Coming Soon! Woman finds her ring on a carrot! Wow, this story is absolutely amazing! 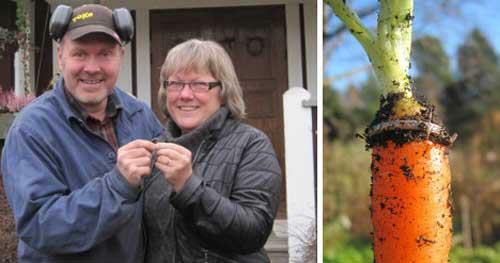 A woman in Sweden lost her white gold wedding band, in her kitchen sink around 16 years ago, and recently found it wrapped around a carrot growing in her garden! How did her ring get from her sink to her garden, you ask? The couple believes that the ring may have fallen in the sink and was lost in the chopped vegetable peelings that were later thrown out into their compost… which in turn, the compost could have been fed to their sheep. After she lost her ring, she looked the whole house over in search of it. During their home renovations, their tore out the kitchen flooring hoping to find the ring. Now that she’s found it again, she plans on having it re-sized. Hopefully, next time she’s chopping up veggies in the sink, she will store her ring in a safe place! This entry was posted in Jewelry, Jewelry News and tagged carrot ring, Jewelry, jewelry warehouse, ring, ring found on carrot. Bookmark the permalink.